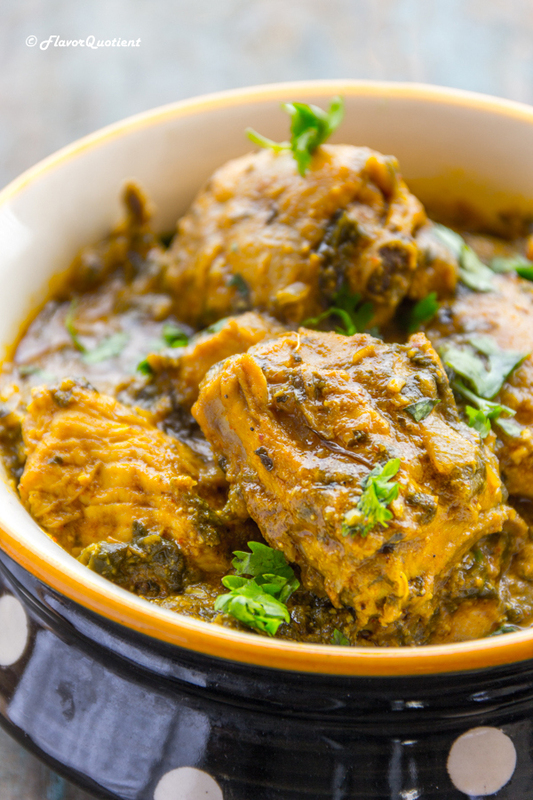 Chicken curry flavored with Indian spices and lots of Fenugreek leaves / Methi Murgh has got the sensational combination! Life sometimes transforms into a roller-coaster and that too on a broken track! Moreover, to make it worse you don’t even have a seat belt! The last two weeks of my life was no different than such dangerous ride. Every morning I was waking up fearing what challenge I would have to face next! But even then I am still surviving! No, I won’t ask you to listen to all my woes and become my agony aunt; I would only humbly request you to wish me strength to survive through this tough phase of my life. We are at a new apartment now where my kitchen is much smaller than the previous one. So I have to apply all the tips and tricks to make this tiny kitchen function to its fullest and continue creating my favorite dishes without any compromise. At the same time while we are trying to settle down at the new place, we are planning our own dream house! Yes! Our own house! The thought itself is so pleasing that it makes all the difficulties hush away instantly. I have already started designing my dream kitchen and my better half is busy in planning his garden! Though there is still some time for this dream to materialize, there is no harm to virtually start living in our dream world! 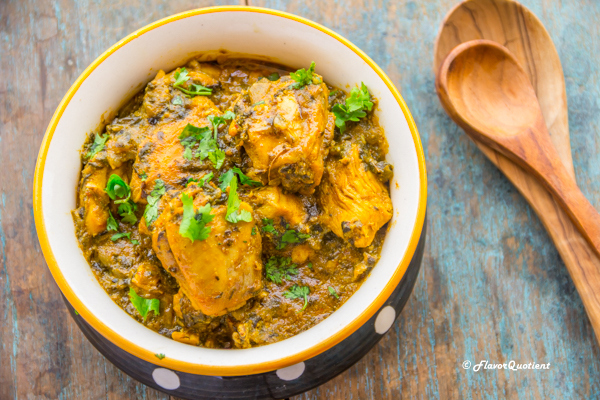 The recipe which I thought of sharing today is ‘Methi (Fenugreek Leaves) Chicken’ / Methi Murgh, a traditional Indian delicacy which you might have had at many occasions. I made it for the first time months ago and liked its complicated taste quite a bit. 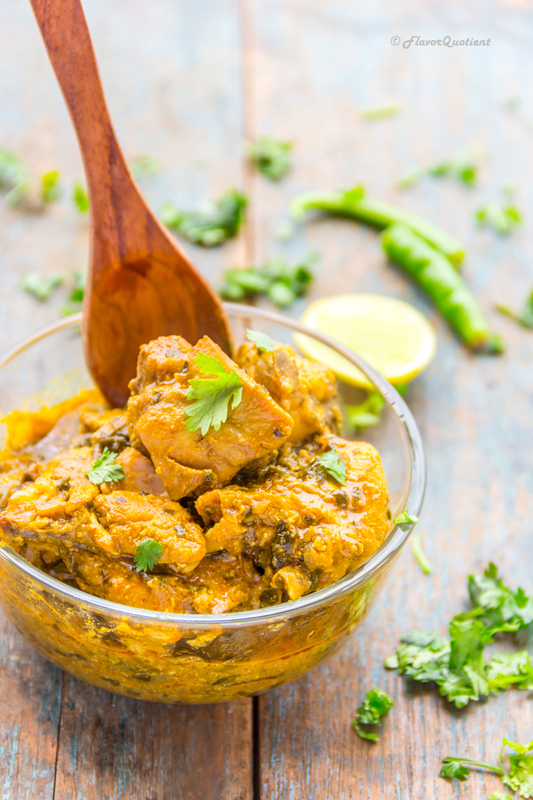 It is best accompanied with crispy butter naan but paranthas (flat-breads) will also be a good option. Cut the whole chicken into medium pieces. Get rid of any excess fat. Mix together yogurt and 1 teaspoon of salt in a large bowl. Add the chicken pieces and coat well. Marinate for half an hour or more. Chop half of the ginger and cut the rest into thin strips. Heat the oil in a skillet; add the green and black cardamoms, cloves, cinnamon, bay leaf and mace. Sauté for a minute. Tip in the chopped onion and sauté till they are soft. Add the chopped ginger, garlic and green chilies. Cook till the onions turn brown. Add the chopped tomatoes and sauté till they are melted. 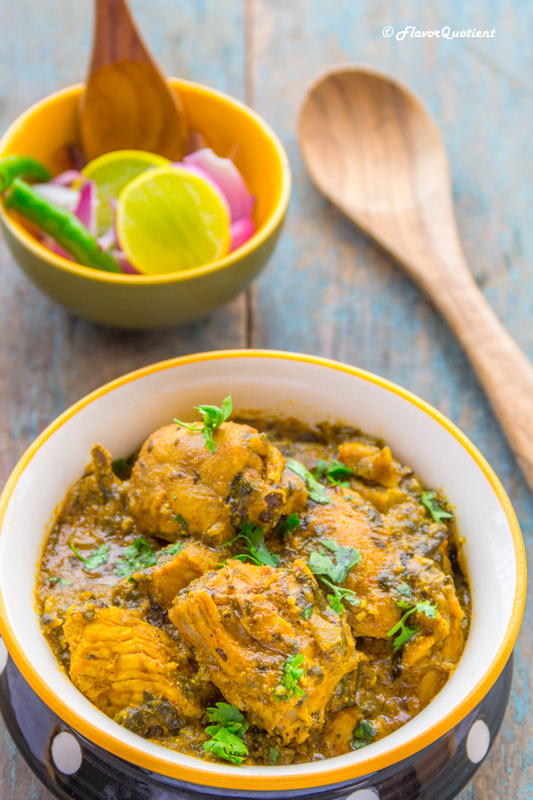 In a small bowl, make a smooth paste of turmeric powder, coriander powder and red chili powder with one-fourth cup of water and add it to the skillet. Cook for a minute or two. Now add the marinated chicken along with the marinade and fenugreek leaves. Stir to mix everything well. Cover and cook over medium heat till the chicken is tender. Keep stirring in between to prevent it from sticking. Do not add extra water at this stage since the chicken will also leave a lot of water. Add water only if you see that the chicken is sticking to the bottom of the pan and tends to burn or if you feel the gravy is too dry. Make the consistency as you desire. 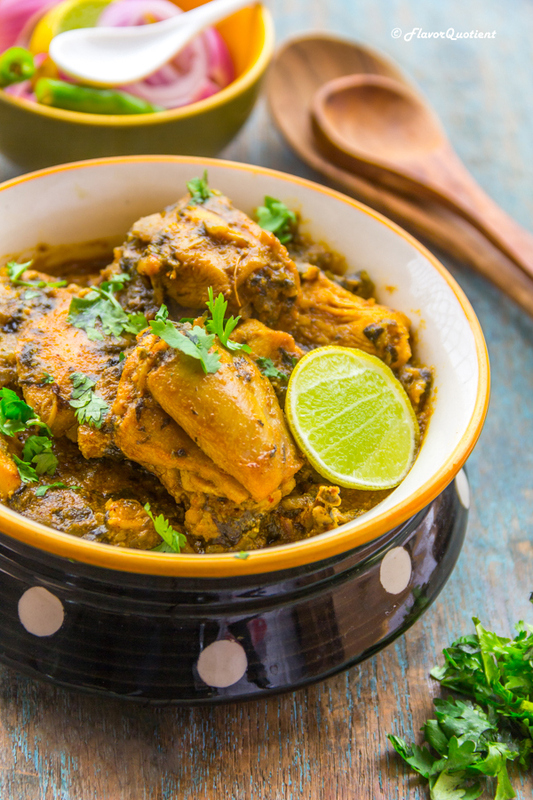 Once the chicken is cooked thoroughly, sprinkle the ginger strips, fried fenugreek leaves and chopped coriander leaves over the chicken. Cover and leave it to stand for about five minutes before serving. Enjoy with butter naan or basmati rice.